Careful Food: What Can be More Instant than Mash? What Can be More Instant than Mash? Who's eating all the instant mash?...Don't look at me. I can't stand the gloopy stuff. And I know it's not you. So whose guilty secret is instant mashed potato? Somebody's eating it, with an estimated 140 million servings of the best-selling brand alone sold each year it's unlikely to be one Smash fetishist. Yet ask around and nobody seems to want to admit to it. Mumsnet parents were unflinching in their excoriating criticism when one poor mum blundered onto the lower reaches of the moral high ground and asked for recommendations for the best instant mash, so modern switched-on parents are clearly not spooning it into their offsprings. Yet still it dissapears off supermarket shelves to be secretly and shamefully consumed. The pasty potato-pariah was recently rounded on as being beyond the pale when Foodbanks included it in their offerings for people in food poverty. According to FoodPoverty UK, people who are desperate enough to need a Foodbank parcel would still prefer fresh food, if it's available. And I doubt that anyone would disagree that fresh is both nutritiously and tastefully better than processed - that's before we even get going on the unpleasant processes involved in making the stuff. I think though that when we ask who is eating it, we are asking the wrong question. If you pick beneath the skin of the Mumsnet Smash-gate debate you find are a small number that confess to Smash (I imagine them in tears as they do so). '...I only use it occasionally, if I'm late and the kids are hungry...' Sobs one guilty mum. Convenient and easy. A tired mum with hungry kids. Instant. 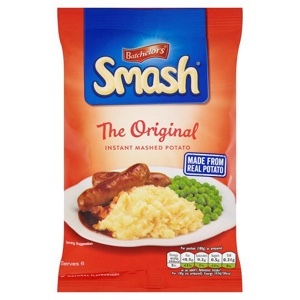 People who want instant food eat instant mash. So what can we, the people that purport to care about good food, offer by way of instant real food replacements, to save our children's innards from being gummed up by gloopy goo? The ultimate easy meal must be porridge: three minutes in a microwave. Yet even this isn't quick enough: people still by kettle-ready porridge pots and you do pay for convenience. Yet you can easily replicate it with this porridge-in-a-mug recipe. If you can get over using skimmed milk powder and (horror) sugar, this really works. And if your food angst won't stretch to a blob of Nutella it would work equally well with Agave nectar or your other favourite ok-to-use sweetener. As instant as a cup of tea, and fun for kids: food in a mug. When we who care about food think about helping people to eat better we should perhaps give a mind to the scale of the task we are asking them to take on. When frenetic lives demand pan-free, technique-free, instant food we should perhaps be offering exactly that. On the difficulty scale where instant mash scores less than 1, and Masterchef/BakeOff is close to 100, I reckon my mug-porridge is less than 1. And this brilliant recipe from Can Cook is about not much more than 1.5, and healthy with it. I give you the Not Poodle...and don't tell anyone, but if you use a lovely curry paste like Fundamental's (https://fundamentallyblog.wordpress.com) you can turn it into an instant gourmet snack! Let's take a few steps down from our lofty food pinnacle and start meeting people where they are. Maybe then they will be more likely to think about real food for their families, that works in their lives.